DEWALT FLEXVOLT High Efficiency Accessories are engineered to Maximize Runtime. The hole saws feature a self-feed pilot bit for fast, efficient cutting, carbide teeth for long life, and a thin kerf design for high efficiency. For use in cordless and corded tools. The DEWALT DWAFV02916PB Hole Saw includes a Pilot Bit. Set includes one 7/8 In., one 1-1/8 In. and one 1-3/8 In. thin-wall hole saws. Maximum recommended 1/4 In. cutting depth. Plastic case. Fast and easy starts, even in the hardest materials like porcelain and granite. Quick Change" universal hole saw system allows change to any size or type of hole saw in seconds. For use only with machines designed for wet sawing and on a GFCI-protected circuit. The DEWALT DWAFV0614 FLEXVOLT 6-1/4 inch Carbide Wood Hole Saw Blades are engineered to maximize runtime. It offers carbide teeth for long life, and a thin kerf design for high efficiency. For use in cordless and corded tools. These new, high performance hole saws deliver faster cutting performance and increased productivity versus standard bi-metal hole saws. Unlike anything on the market, Diablo's hole saws and SnapLock Plus mandrel system simplify the attachment process for fast and efficient hole saw mounting. These radical new hole saws provide ultimate cutting length to bore deeper holes in a single pass, tool-free plug ejection and Variable Tooth Design for faster cuts. 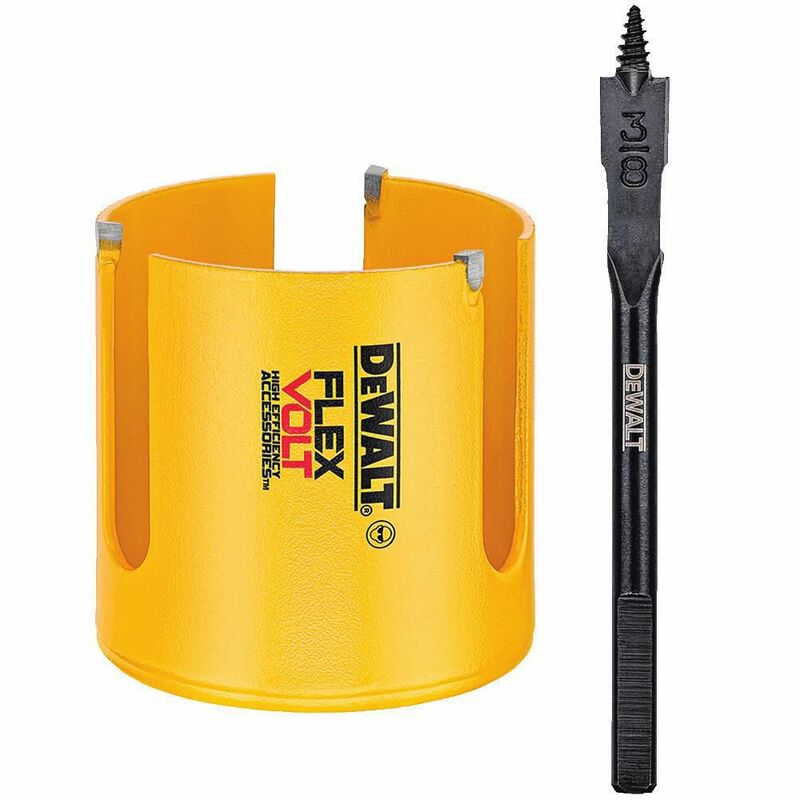 FLEXVOLT 2-9/16 Inch Carbide Wood Hole Saw with Pilot Bit DEWALT FLEXVOLT High Efficiency Accessories are engineered to Maximize Runtime. The hole saws feature a self-feed pilot bit for fast, efficient cutting, carbide teeth for long life, and a thin kerf design for high efficiency. For use in cordless and corded tools. The DEWALT DWAFV02916PB Hole Saw includes a Pilot Bit. FLEXVOLT 2-9/16 Inch Carbide Wood Hole Saw with Pilot Bit is rated 1.0 out of 5 by 1. Rated 1 out of 5 by kSeebs from Buyer beware: I ordered this item, however the mandrel WAS NOT included - Only the hole saw and t... Buyer beware: I ordered this item, however the mandrel WAS NOT included - Only the hole saw and the pilot bit.